The Jagdtiger organization was the typical late war independent heavy tank destroyer battalion. My search for any K.St.N. that would have been used in this battalion turned up zero documents. 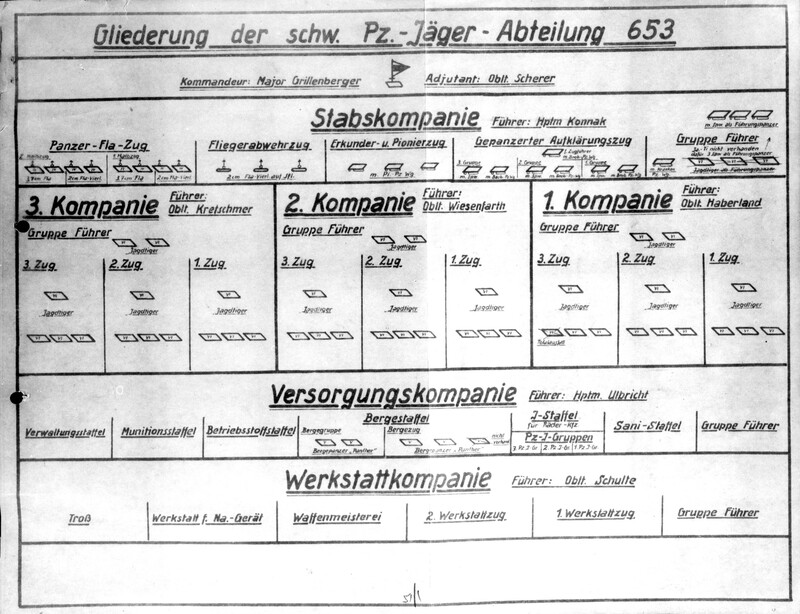 I did, however, find a Gliederung (Organization Diagram) of s.Pz.Jäg.Abt. 653 that does a great job of showing the theoretical vehicles assigned to these units. 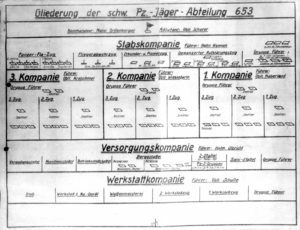 The Jadgtiger battalion had the general schwere Panzerjäger Abteilung organization: Staff, HQ Company, three Tank Destroyer Companies, Supply Company and a Workshop Company. 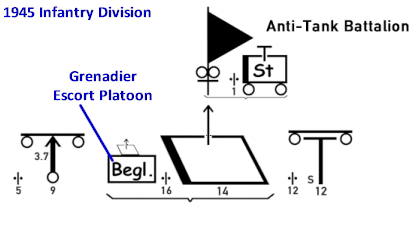 The diagram shows the typical three tank destroyers in the HQ Company, but these were crossed out and replaced with medium halftracks. This was probably a wise decision as the Jagdtigers proved to be extremely unreliable. The diagram also shows the optional Flakpanzer platoon of eight Flakpanzer IV’s (four 2 cm quad and four 3,7 cm). The HQ company has a total of fourteen medium halftracks and three 2 cm quad anti-aircraft halftracks (Sd.Kfz.7/1). The Tank Destroyer Companies each had fourteen Jagdtigers for a total of 42 for the battalion. 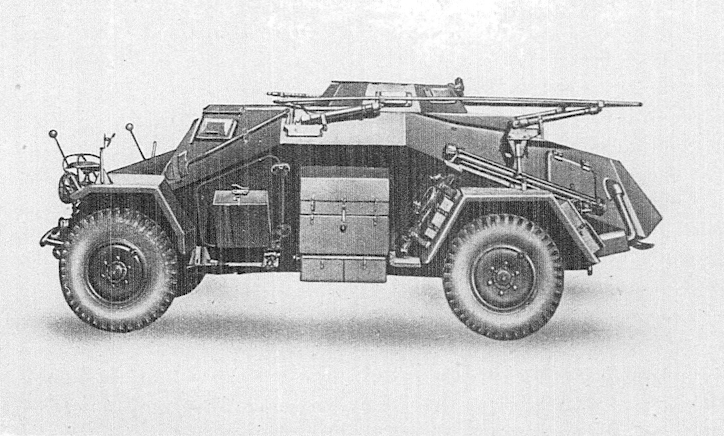 Other vehicles of interest were the five Bergepanthers. 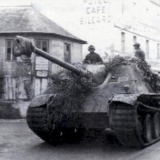 This organization was very similar to that of the Jagdpanther, which can be seen here. Only two heavy tank destroyer battalions were equipped with the Jagdtiger. 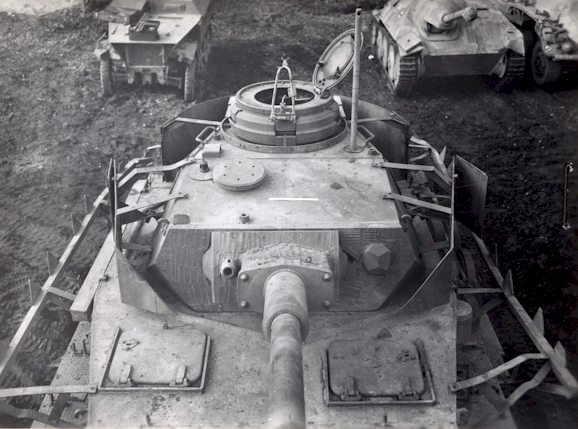 These were schwere Panzerjäger-Abteilung 512 and schwere Panzerjäger-Abteilung 653. 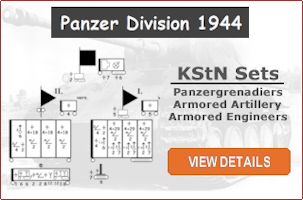 The first to be formed was the schwere Panzerjäger-Abteilung 653. This unit was selected to be equipped with the Jagdtiger because of its successful combat experience with Ferdinand’s in Russia. This provided the unit with highly experienced commanders and crews. The unit received twelve Jagdtiger’s in October of 1944. Training began with these twelve Jagdtigers for 1/653 and 3/654. By the end of November, the battalion had an almost full complement of men. The Jagdtiger were another matter. Multiple production and reliability issues had reduced expected production. As a consequence, at the end of December, the two companies still did not have a full complement of Jagdtigers. An attempt was made to deploy the companies for the Ardennes offensive. However, transportation problems prevented all the trains from reaching their destination. 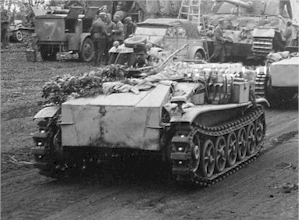 The schwere Panzerjäger-Abteilung 512 was the second unit formed around the Jagdtiger. It started receiving Jagdtigers in February of 1945. The first five Jagdtigers released to s.Pz.Jg.Abt 512 were recorded (as released) on 30.1.1945 and taken on to Döllersheim on 12.2.1945. A further six were released from the factory on 14.2.1945 After subsequent recall of these eleven vehicles, the release entries were lined out. On the 16th of February, an order was sent by OKH delaying the equipping of 512 because of serious mechanical problems with the steering units. The same day, the order was issued to change all steering units after design changes had been completed. On the 5th of March, the first five Jagdtigers arrived at Sennelager followed 2 days later by another train with their other five Jagdtigers. The 12.8 cm ammunition had been sent directly from Magdeburg. All the Jagdtigers arrived with their transport tracks fitted, the battle tracks having been sent to Sennelager from the August Engels factory at Velbert. On the 13th of March, two trains arrived at Sennelager bringing the ten Jagdtigers of 1/512. Carius knew that the following day he would have the three trains required for transporting his fighting company to the action area. That night, he gave his troops an evening pass after they had got all their vehicles to the station and camouflaged them. Only a few of the support vehicles where available to make the first journey with his company. On the 14th of March, 2/512 were loaded onto rail transport at Sennelager. The train with 2/512’s other five Jagdtigers and the two trains with ten Jagdtigers from 1/512 were unloaded near Olpe.